Stuff NZ - Invercargill girl guides Sell-ebrates 60 years of biscuits! Emilia Brown, 10, Lydia Blomfield, 12, and Ava Wairau, 9, of the Waikiwi Guide unit, enjoy some Girl Guide biscuits. Young Invercargill girls are learning new skills while having fun with their peers as they hit the streets to sell Girl Guide biscuits this year. The popular biscuits are up for grabs in the city again for the 60th year, and are expected to sell more than 1000 cartons on par with previous years. 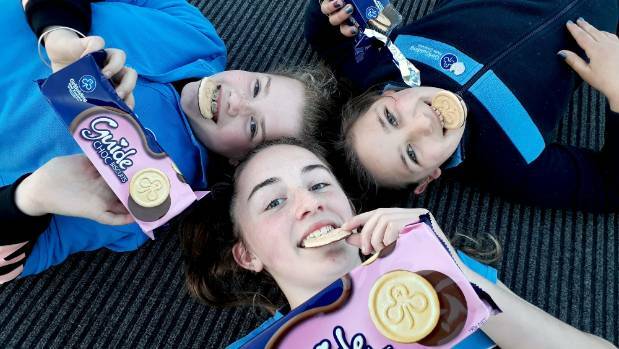 Girl Guiding New Zealand Invercargill biscuit champion Rachael Hewton said in Southland, about 200 Pippins, Brownies, and Girl Guides, would be selling the treats. The girls and volunteers would be meeting a high demand by selling a significant proportion of the 220 tonnes of biscuits throughout the country, she said. But as well as having fun, the girls learn skills in maths by managing change, learning about the marketing side of sales and also confidence by approaching people and talking. Biscuit sales were also important for the girls to get out in the community and raise awareness on what Guiding was all about, Hewton said. The effort put in by biscuit fundraising would lead to welcoming more girls and their families into the Guiding movement. "The availability of our famous biscuits are hotly anticipated and proceeds from their sale accounts for a third of our national annual income, which goes towards giving girls confidence and leadership skills while making friends and lifelong memories." People loved the opportunity to buy them every year, and numbers remained steady. Southland definitely stood tall compared to the rest of the country with their sales, especially with farmers in the region favouring them, she said. "Do you dunk them, spread them with butter, or perhaps you like to bake with them into a chocolate fudge or as a cheesecake base?" For the first year, a Pop Up store at 63 Esk St, Invercargill will sell the biscuits from September 12 to September 24, or while stocks last. The store was highly requested by the public, so this year the store would be the main area for people in Invercargill to buy theirs, Hewton said. It will be open 10am-4pm Monday, Tuesday, Wednesday and Saturday, 10am-4.30pm Thursday and Friday, and 10am-3pm Sunday. But not to worry if you cannot make it to the store, they are now also available to customers online.